Golf equipment isn’t just all golf clubs and golf balls – having the right apparel is an important piece of the puzzle as well. While you probably want to look good on the course, proper apparel can also help you to perform better on the course by keeping your comfortable and not interfering with your swing. There are plenty of garments out there that can keep you warm and dry, but only the best will do so while also allowing you to make good swings. For a relatively young brand, Under Armour has made a big impression on the golf market. Golf has generally been dominated with long-standing, traditional brands, but UA has changed that trend and can now be seen on courses all over the country. Under Armour has sponsored some notable players on the PGA Tour as well, to make sure they gain credibility and visibility in the competitive golf market. This pullover is just one example of the many great pieces of apparel offered by this popular brand. One of the key elements of any piece of golf apparel is versatility, and the Member’s Bounce Pullover fits that bill nicely by being useful in a variety of situations. You will likely find that the pullover is able to keep you warm on a cool spring morning before the sun gets up and warms the air, but it is also light enough to wear during the day when the clouds roll in. When you have an item like this in your bag, it allows you to carry fewer overall garments because this one is capable of keeping you comfortable in a variety of conditions. Keep your bag lighter, but yet be comfortable by utilizing this comfortable long sleeve pullover. While you might have a few different pullovers in your closet that you wear from day to day, they aren’t necessarily designed for use on the golf course. 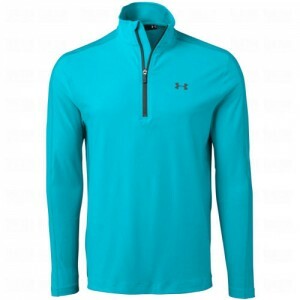 This Under Armour item is built for golf, so it will permit you to move in all the ways you need during your golf swing. Non-golf garments tend to get tight, especially in the shoulders, during a swing which can inhibit your ability to score. Make sure you are using a golf-specific garment when you hit the first tee so your swing is free to be at its best. With a variety of great colors available, the Under Armour Men’s Member’s Bounce Pullover is an item that almost every golfer could use. Whether you need a garment to wear all round long during the cool season, or just need something for a few holes in the morning, this pullover is likely to be perfect for the job.